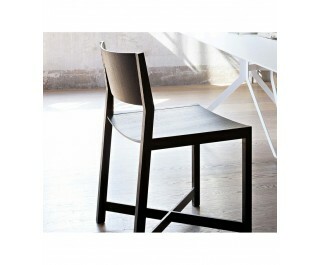 Daiku is the archetype of the solid wood chair of the third millennium: simple and linear yet warm and strong. The slightly concave seat combines with the inclined back to provide the best in comfort, while at the base two cross pieces join the legs and combine a functional need with a delicate, geometric aesthetic detail. The name of the chair comes from the Japanese name for the master carpenters of Kyoto who constructed the magnificent Japanese temples.